Most of the punters ask me what is meant by Back (LAGANA) and Lay (KHANA) in betafir exchange, so I decided to write an article about the same. In simple words "back" means we are backing a team/player to win and "lay" on the other hand we understand backing against the team/player to loose the match. We are taking an example to understand it clearly. In our example we are taking 2 teams lets say Mumbai and Kolkata. The Blus box u see is for Back (lagana) and the pink box u see is for Lay (khana). We see the rate of Mumbai back is 1.77 that means if we bet $10 on Mumbai we get a return of $7.8 and if we place $10 back bet on Kolkata at 2.28 we will get $12.8 in return. Now lets come to the "LAY" part. Laying bets sometimes causes controversy because you are betting on someone/something losing. We normally use lay when a team comes at a lower odds. 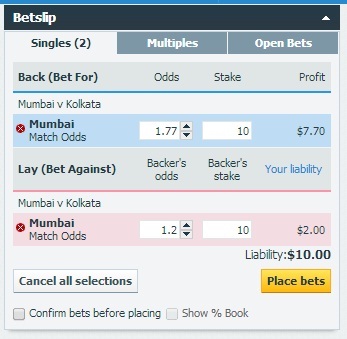 For example in the above picture we see the lay odds of mumbai is 1.78 which means if we place a $10 bet @1.78 odds our liablity will be 7.8$ and if we win then we will get $10 in return. More the lower odds is Lesser is our Risk. In the below image u can see one is mumbai back (bet for) in blue colour and another is Lay (bet against) in pink colour. In the back the odd is 1.77 when we say 77p in our local term. this means if we place a bet of $10 we get a return of $7.70 on the other hand if we lay Mumbai @ 1.20 odd with $10 then our liablity will be only $2and if mumbai lose the match then we will get $10 in return. Lay is best for low odds match in which we can make more profit with less risk. Back matlab Khana and Lay matlab Lagana. Back hum us team ko karte hain jis team ko hume jeetana hota hai and Lay hum tb use karte hain jb us team ko harana hota hai. Back to hum kisi bhi team ko kabhi bhi kar sakte hai but lay ko use karne ka sbse bada faida hota hai low odds me. Jaise ki upar ka example dekhya gya hai ki Mumbai Lay ka rate 1.2 hai to agar hum mumbai ko Lay karte hain $10 se to hamara risk kewal $2 ka hoga and agar mumbai win hoti hai to hume $10 ka profit milega. Lay low odds me karna chaya jis se hamara Risk kam ho and profit jayda ho, main bar bar yahi kahunga ki aap log har match me trading kiya kro na ki betting. Trading and Betting me kya kya difference hai ye janne ke lia aap plz ye article padho: Trading not Betting.